Does PingPlotter work in a virtual machine environment? Can I run PingPlotter in a virtual machine environment such as Parallels, or VMware? Absolutely! We've tested our products pretty thoroughly in both Parallels, and VMware - without any sort of issues. That being said - some adjustments need to be made in the network settings of both of these environments in order to get things working. Switching the network configuration to bridged mode gets things working as you'd expect - and it's pretty easy to accomplish. You can adjust your network configuration to use bridged mode by going to "Devices" -> "Network" -> Bridged Network," and then choosing the appropriate adapter (Default, Ethernet, Wi-Fi, etc). 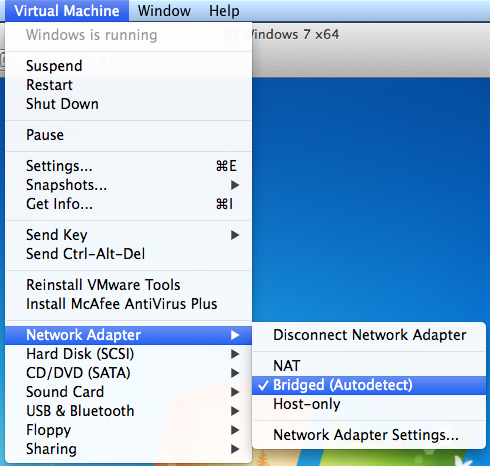 You can choose a bridged connection by going to "Virtual Machine" -> "Network Adaptor" -> "Bridged." Unfortunately, PingPlotter doesn't work under Wine (or CrossOver - which is based off of Wine) - for a variety of reasons. The biggest show stopper with Wine is that it must be running as root to create the raw packets that PingPlotter requires. This creates a pretty serious security problem that could allow Wine to corrupt your host machine. The Wine creators strongly advise against running Wine as root - and as a result of this, we've stopped supporting PingPlotter in this scenario. What does "New route changes logged" mean? Different sources show different results at same target.